In December, right before Christmas, I visited Morocco with my brother. We had a week to discover some of the beautiful places of that country. 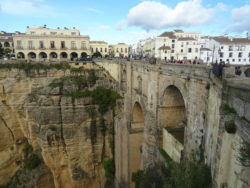 Today I would like to share with you our one week itinerary! 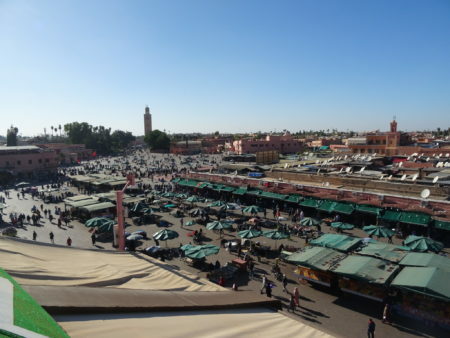 We took a flight from Vienna to Marrakech and in the evening we arrived to our hostel called N12. On the way to the hostel, we had to cross the big square Jemaa el-Fnaa which was quite crowded but it was nothing comparing to the street that led us to our accommodation. There was a big crowd of people moving very slowly and there were people on motorbikes trying to get through the crowd. It was just insane, at least it seemed like that the first day. Then we kind of got used to it! Anway, when we got to the hostel, we were immediately offered a Moroccan tea and as we found out later on, they do it always even before asking for a passport. We were talking with the owner for a long time, he gave us a lot of advice about what to do and see. Because we were very tired after the long travel, we went to sleep early to be fresh for the following day. On the first full day we went to see the Koutoubia mosque. It’s near the main square Jemaa el-Fnaa and it’s actually the largest mosque in Marrakech. Behind the mosque there is a park Lalla Hasna. It’s quite relaxing park with a fountain and long basin that goes along the path. 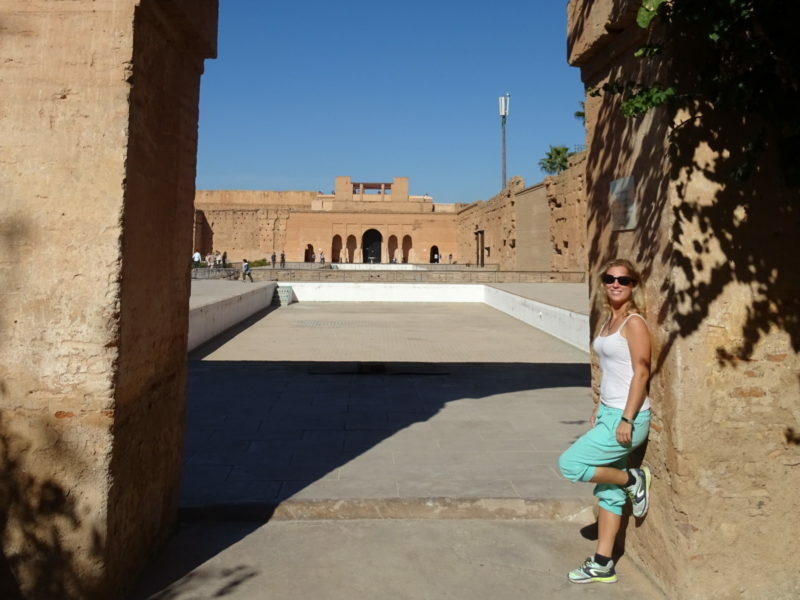 After the chilling out in the park, we decided to visit the Bahia Palace. We had to go back to the main square and take other street to get there. It wasn’t difficult to find it with offline maps 🙂 To enter the palace you have to pay the entrance fee which is 70 dirhams and it’s worth paying it. The palace is very beautiful, it was built in 19th century and it’s one of the masterpieces of Moroccan architecture. On the way back to the main square, we ate lunch on the street and then we went to Café de France. We sat on the roof terrace, asked for a coffee and later a mint tea as well. The waiter wasn’t pleasant at all and that was the only negative thing otherwise it’s a nice place. From the roof terrace we had an amazing view over the whole main square and we could enjoy the sunshine as well. After perfect chill out we wanted to visit another palace, unfortunately it was already closed so we put it on the plan for the last day. As we didn’t want to get back to the hostel, we kept walking around and we bumped into the Kasbah mosque. 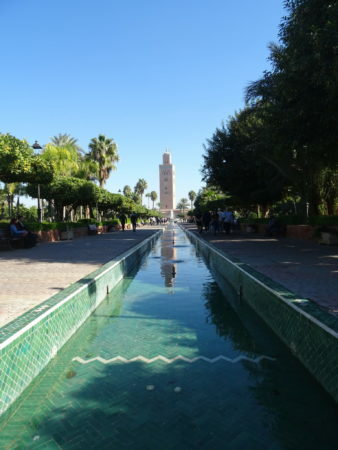 It’s located in the old kasbah of the city and it’s one of the most important historical mosque in Marrakech. When we were walking back to the hostel, we stopped for a dinner. Finally we could try the typical Moroccan chicken tagine and cuscus. Unfortunately, as we found out later during our stay, it was the worst tagine that we had eaten in Morocco! Nevermind, after the dinner we went back to the hostel, we prepared things for the desert tour and we went to sleep as we had to wake up very early morning the following day. 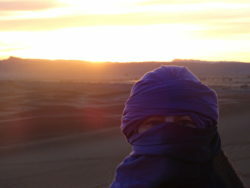 Before going to Morocco, we got really excited by the idea of spending night in the desert with Berbers. As we arrived we were offered to join the 3-day organized tour for reasonable price so we didn’t hesitate and decided to do it. It was an amazing experience! On the way to the desert we also visited following places: Al-Haouz – Zerkten, Aït Benhaddou, Ouarzazate, Dades valley with the Monkey toes, Tinghir and Todgha Gorges. You can read more about the tour in my post 3-day desert tour from Marrakech to Merzouga. In the morning we went to the bus station by taxi and we took a bus to Essaouira. With short break, it took around three hours to get there. In Essaouira we had the best accommodation which I would definitely recommend. It is called Dar Mouna Mogador. 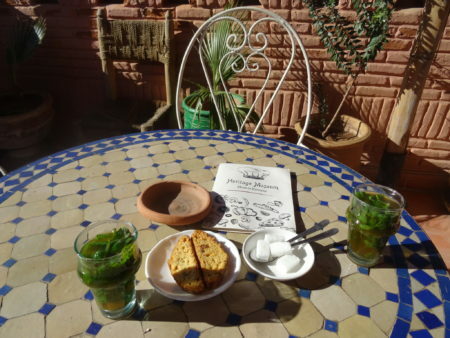 It’s a typical riad with a terrace on the rooftop where the best breakfast in Morocco is served. The location is just perfect, not far from the bus station and near the centre. Essaouira is located on Morocco’s Atlantic coast. It’s an easy place to spend some relaxed days. 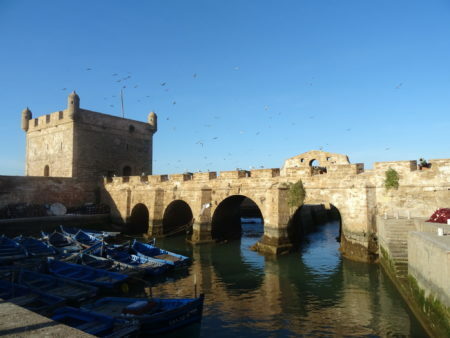 Back in 19th century, Essaouira was Morocco’s biggest port. We went for a walk to the port where we got lunch as well. There is a fishing market where you can choose fish and/or seafood that you would like to eat and they prepare it for you on the grill. We tried different kinds of fish and seafood but the seafood wasn’t as good as we thought it will be. It was partly burnt so it wasn’t that tasty. 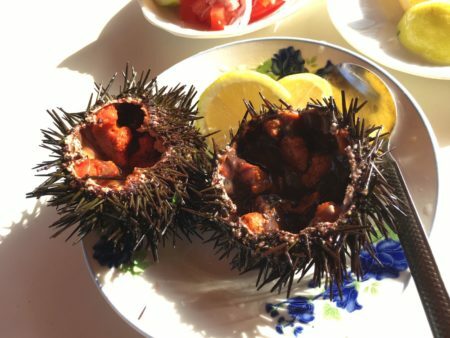 As a speciality we could try the sea hedgehog, normaly you just eat its eggs with a bit of lemon juice on it. It was the first time we had ever tried it and probably the last one. We didn’t like it at all. Later on we were just walking around, enjoying the beautiful weather and then we did some shopping as well. There are many shops where you can get nice stuff, just don’t forget to haggle. The other day we were walking along the seaside and then we just sat on the terrace and ordered Moroccan mint tea. It was a perfect chillout before our trip back to Marrakech. We spent last two nights in Marrakech in Riad Wink. 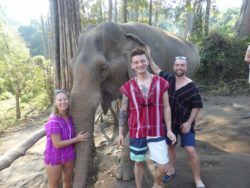 It was more expensive than our accommodation before but we didn’t see much difference. The room was quite small, we were expecting a bit more for that price. The terrace on the rooftop was pleasant though. On our last day we decided to visit the Heritage Museum which was situated just near the hostel. 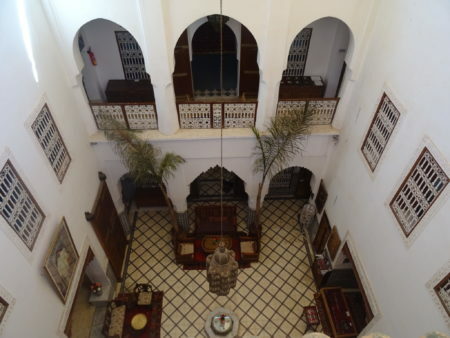 The museum is actually an old riad with collection of Moroccan artefacts. It was opened to the public in 2016. The entrance fee is 50 dirhams which includes a mint tea on the rooftop terrace. After that we went to the Badi palace that I already mentioned before. 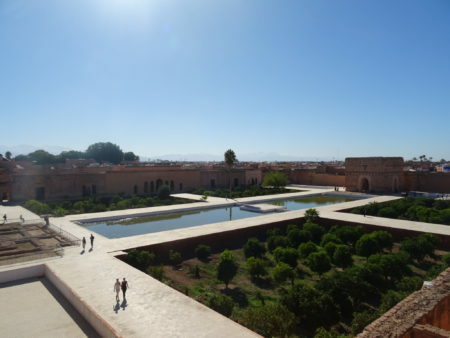 Badi palace is not far from the Bahia palace. The entrance fee is 70 dirhams but it’s worth paying it. I like that palace even more than Bahia. The palace was built at the end of 16th century. It used to have more than 300 rooms decorated in gold, turquoise and crystal, in addition to a large pool, sweeping courtyard and several gardens. When we finished the visit, we went to have a lunch and then we went to the rooftop terrace of Café de France. We just wanted to enjoy the sunshine before going back to the snowy Czech Republic. Later on we did our last shopping in order to spend the rest of the dirhams. After dinner we were chilling out on the rooftop terrace of our riad, we packed our things and we were ready to leave Morocco even though we didn’t really want to! In the morning we got a transfer to the airport. We arranged the day before through our riad. It cost 10€ which was very good price. We had a flight back to Vienna and then we took a train to get back home. I have to say that we really enjoyed our week in Morocco. The best experience was the desert tour, it was something exceptional and we loved it. 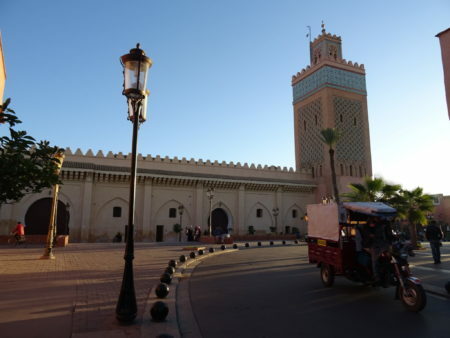 We had a great time in Marrakech and Essaouira too. 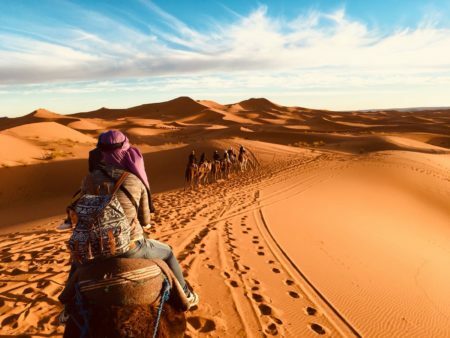 If you ever come to Morocco, this one week itinerary can be your inspiration. 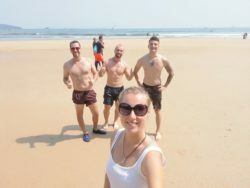 One week is quite short time for discovering many places of that country but it’s enough to get a taste of Morocco and one day you’ll just come back to see more!